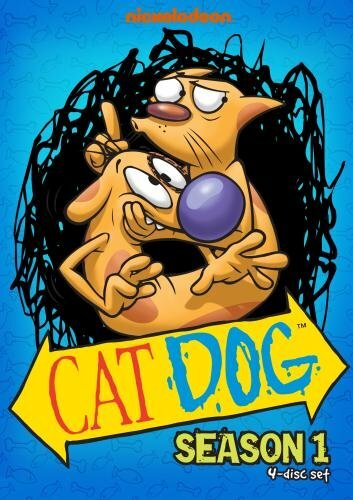 Along with such classics as Hey Arnold, The Wild Thornberrys, Rocko’s Modern Life, and The Angry Beavers, Catdog was a staple of Nickelodeon’s Nicktoons block in the late '90s. Most Nicktoons had a fair amount of weirdness about them, and Catdog was no exception. It was perhaps the ultimate odd couple, with a cat on one end, and a dog on the other end of the same body. The cat acted cultured, and hated water, while the dog likes to chase vehicles, especially garbage trucks. One would expect such mortal enemies to be constantly fighting, but the two are actually the best of friends. The friendship gets sorely tested early in the first season however. During “Flea Or Die” a trip to the beach is cut short when Catdog is infested by a massive amount of fleas. Dr. Rancid Rabbit suggests a flea dip to cure the problem, but Cat will have none of it. They agree to wear a “flea-belt” instead, but it only keeps the fleas away from one head at a time. Plus, belts are hopelessly out of style. Cat finally comes to his senses when Dog is nearly suffocated by the fleas, and agrees to the flea dip. Finally flea-free, they decide to head back to the beach to check out the females. In the interim however, belts have become the coolest accessory around, and Catdog are ignored for being so gauche as to not be wearing one. Another memorable episode is “Catdog Food.” In this one, we find Cat taking part in a marketing research test for a new brand of cat food. Dog is (as always) hungry, and asks for some of the cat food for himself. He loves it, and the powers that be realize that they have a goldmine, with a food that both cats and dogs enjoy. They call it “Catdog” food, and hire Catdog to be the spokes-animals. Instant celebrity status follows, and soon Catdog are riding around in a limo, with fellow big-shot Barry Baboon. Cat stuffs himself, and is soon as grotesquely obese as Bernie. He is also twice as obnoxious. The producers finally get tired of him and introduce Hamster-Parakeet Food, with a puppet hamster and parakeet as product representatives. Those are just a couple of the adventures Catdog get into on the newly released Catdog Season 1, Part 1. The double-DVD set contains a total of 20 Catdog episodes, and has been issued by Shout! Factory. My kids were five and eight when Catdog premiered, and watched it religiously on Nickelodeon, so I got my fair show of exposure to it as well. The ‘toons are consistently funny, without any mean-spirited jokes, and hold up quite well today. According to the flyer included with the set, Shout! Factory will also be releasing a number of other Nicktoons to DVD shortly, including Hey Arnold, and The Wild Thornberrys. So keep an eye out, because nostalgia is a funny thing. I had to watch all four hours of Catdog with my now 19-year old son, and he still wanted more. Fair warning, the show remains addictive, even over a decade later.